If you’re looking for an intimate dining atmosphere or a romantic rendezvous with your significant other, Wichita offers several options for the perfect dinner date. Here are the five most romantic restaurants in Wichita and some of the popular dishes. This one-of-a-kind restaurant features tapas, wines and a cigar lounge. Get cozy with your loved one and share a small plate of Mediterranean, Spanish or Asian appetizers during dinner at Frèdös. Wine tastings are held twice a month and a late-night cocktail menu is available. The name itself means “handsome friend,” in French, and it’s the perfects spot to cozy up to your love. French Mediterranean restaurant, Café Bel Ami is a perennial favorite. This quiet retreat in the middle of downtown Wichita offers delicious options and beautiful décor. This charming dining room brings French dishes cooked fresh in an open kitchen environment for the one of the most romantic experiences in Wichita. Patrons love Georges French Bistro’s steak frites, scallops, crepes and homemade desserts. Getaway from the city lights with a short 20-minute drive north to Elderslie Farm for a modern five-course farm-to-table dinner year-round. This intimate dining experience brings a romantic flare to any evening. Old Town Wichita offers vibrant nightlife and live entertainment, but tucked away is also a romantic restaurant with upscale cuisine. Larkspur Bistro & Bar is great for lunch or dinner and provides a mix of Mediterranean, French, Italian and American dishes. 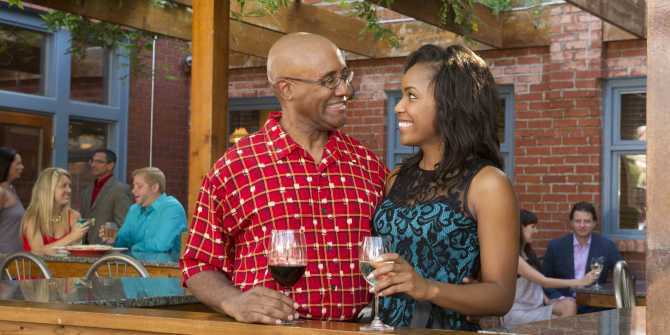 Impress your date with wine and live music on the patio or enjoy the baby grand piano inside. Wichita is home to more than 1,000 restaurants offering a variety of flavors from here and abroad. Let your taste buds travel the world without leaving the city and plan your trip to Wichita today.